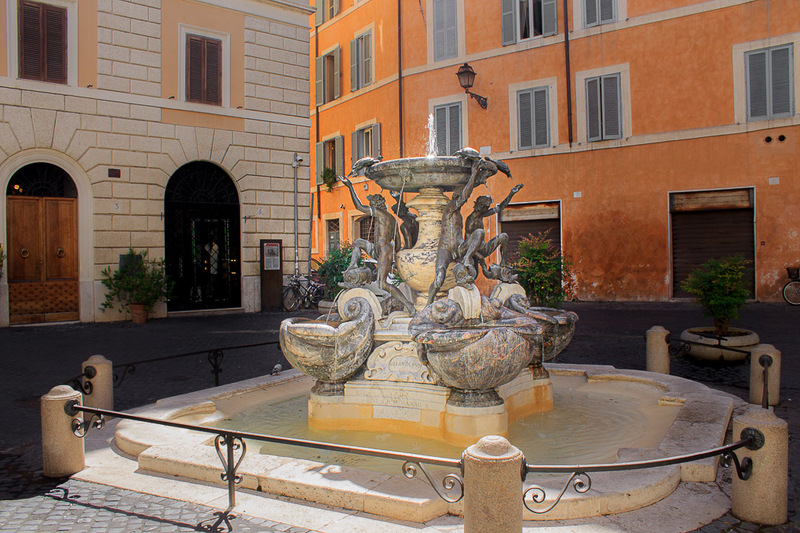 The Turtle Fountain, or Fontana delle Tartarughe, is located in Piazza Mattei, a piazza named after an important family of the Middle Ages whose palace is just north of the piazza. The fountain was designed by Giocomo della Porta in 1581 and the built by him and the sculptor Taddeo Landini between 1581 and 1588, but it was Bernini who added the tortoises in 1658. The fountain was designed, like all Renaissance fountains, to supply drinking water to the Roman population. It uses a common design, that of a single bowl on a pedestal from which water spouts upwards then pours down into a polygon-shaped basin. 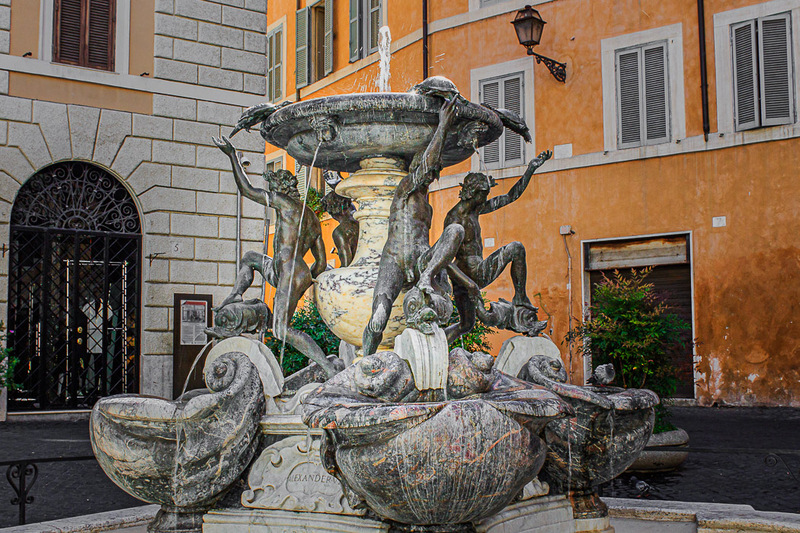 But this fountain has a twist; it is intricately decorated by the sculptor with four young men and four dolphins. They were originally to be made of marble but were actually made of bronze. There were originally eight dolphins but four were removed because of insufficient water flow. The edge of the bowl has four cherubs from which water flows down into the lower levels of the fountain. The four young men each rest one foot on a dolphin, and water pours out from those four dolphins' mouths into four conch shell bowls that overflow into the main basin at the bottom. The additional dolphins used to be held by the four young mens' upraised hands, and when they were removed, the hands seemed to have no purpose. That's why the turtles were later added; they give those upraised hands a job - to prevent the turtles from falling off. The turtles have been replaced with copies since one was stolen in 1979; I don't know where the originals are now kept. The themes of this fountain were paid respect to in the Fountain of the Frogs of 1924. See all Turtle Fountain photos.